Obàtálá belongs to the class of spiritual forces known as funfun. The word mans simply ‘white’. The word fún, which funfun might be a development from or at least have a relationship with do bring the idea of ‘giving’ in the form of applying something as a gift. For instance, fún obinrin means to make a woman’s womb pregnant. From this we might suggest that the word funfun refers to an ability of whiteness to impregnate matter. The whiteness is of course a reference to a sattvic state, to borrow a vedic term. It is the tranquil peace of the mind that carries all possibility. Funfun is contrasted to dudu, or black by dudu representing the forces that, in the words of Awo Falokun, ‘removes the veil of mystery that surrounds the Source of Creation’. We also have a third class, the awon pupa, ‘mysteries of red’, which are spiritual forces intimately related to the blood, the heart, passions and the possibilities for germination of any sort. The use of awon pupa is always a reference to passion and fierceness. In Ifá metaphysics there are only these three colours, and these colours denotes the qualities found in creation as well as the potentialities in Ol’Orun. The spirits that gain the epitaph ‘funfun’ are spirits who partake in the source of creation, the realm of possibilities. They are the first light as spoken of in the last of the meji odus, Ofun meji, at times called Agbababa odu, the grandfather of odu. Obàtálá manifests in the first odu, Ejí Ogbe, which is the light in Ofun manifested. The word Eji Ogbe refers to the act of lifting both hands to heaven. This is both an act of reverence as it is a remembrance of how the manifested creation is possible, namely by the tow forces on the same body. In Ifá metaphysics the universe is seem as a result of inálo, the power of expansion or exhalation and isoki, the power of contraction or inhalation. 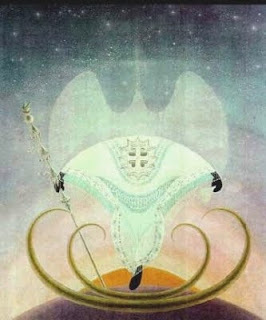 This cosmic pulse is frequently referred to as Orisa ko, referring to male spirits of whiteness and Orisa bo, female spirits of darkness as a reference to the interplay between imo (light) and aimoyé (darkness as the pulse needed for manifestation.